Want to make a supervillain? Want to have others play your villain and use her/him/it in their adventures? Want to see your villain published in a new tabletop role-playing game? Want to be credited for it? If you answered yes to any of these, read on. Kickstarter campaign ends on Friday, March 31 2017 3:48 PM EST. “You’re a 19-year-old runaway in an unfamiliar city. You have superpowers–but you can only use them when you’re happy. So yeah… you might be screwed. Jump into a superhero RPG unlike any other, where your character’s powers can only be accessed through a specific emotion. Lift cars over your head, heal your friends, punch holes in the Moon, but only if you’re sad, or sickened, or surprised. You were so angry, you decided to make a supervillain about it. Name and Design a Canon Villain in the Core Setting: You can choose the name of a villain, as well as their power set, background, characterization, etc. The villain will appear in the Setting chapter of the Core Rulebook, and you will be credited by it. This includes a half-hour video chat meeting with me to discuss your villain’s design, probably in June. Stretch Goal Note: If this campaign reaches $2,000 or more in funding, then it will unlock the Villain Illustrations. I will commission illustrations of all the canon villains as well. Same deal if you chose the “The Hole You Punched in Your Wall” Pledge Level. Without people like you, it would be really hard to get through the day. 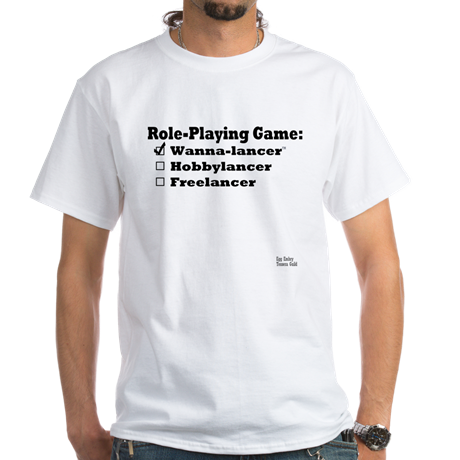 For $25, you name a villain, create their powers, design them (emotionally and physically), have a call with the creator of the game, and, possibly, be a part of a custom illustration of the character. If you want to do a whole faction, it’s $30. For the money, it’s an amazing deal. For my quest to become a role-playing game freelancer and my RPG resume, this adds another unique gaming system, puts me on the ground floor with a new publisher, and lets me unleash a villain on the world of Sensational. This is a good opportunity no matter how I slice it. Let’s talk about the system and its unique feature. Thomas Constantine Moore is thinking beyond the dice to create a system that pushes role-playing over stat min/max-ing. He’s matching superpowers to emotional states. Hulk Mad = Hulk Smash! It’s easy to equate anger to punching harder. But what if you expanded on that ala Geoff Johns’ take on the Lantern Corps of the DC comic universe? 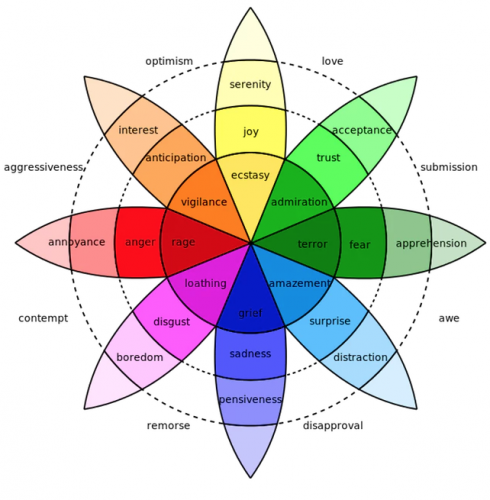 The DC Green Lantern idea matched colors to emotions and created factions for each color/emotion. 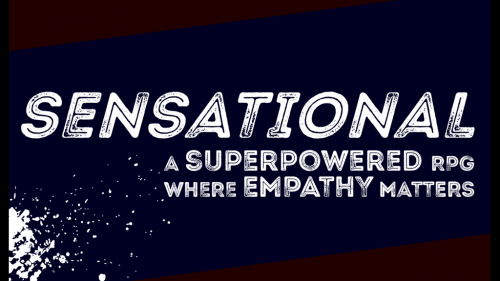 Sensational will match emotions to powers levels so the deeper the character is into the emotion – the more emotional that the player plays the character – the more powerful they’ll be. The concept speaks to me. Egg Whine! Egg Most Powerful Whiner of Them All! I think this project will be fun and I am interested in seeing what the mechanics he creates look like. Out of the gate, his system is about emotions and his pitch and rewards have put a smile on my face so that tells me he’s on the right path. I gotta shout out Thomas’ website. 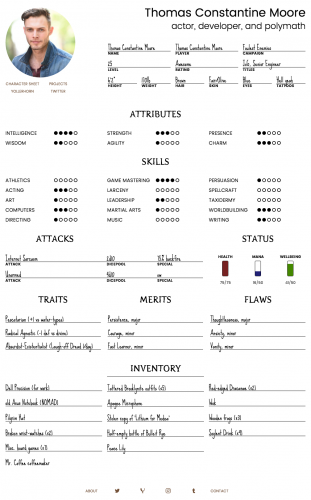 His resume is a character sheet (storyteller system). $#%&ing genius. When I re-do my bio, it’s because his idea was too good to not mimic. Tagged Kickstarter, Sensational: A Superpowered RPG where Empathy Matters, Thomas Constantine Moore, Vanity Press, Wanna-lancer.